A Fiberglass pool is one of the most heavily researched pool types online today! And this is for many good reasons. Fiberglass pools are built in a controlled environment and have many great features that are popular in today’s pool marketplace. With built in benches, sundecks and spas all in a pool that comes in one piece, what more can a future Pool Owner ask for? How about a faster installation timeframe? Well Fiberglass offers that too, with one of the quickest installation timeframes when compared to Vinyl Liner and Gunite swimming pools. Add that to the fact Seasonal World has over 100 models in stock at our Jackson, NJ warehousing facility ready for immediate delivery – Seasonal World is truly the area leader when it comes to Fiberglas pools. has it pros and cons. So what is a Fiberglass pool? A Fiberglass pool is unique in the fact that it is built indoors, in a climate-controlled environment. No other pool structure is built in this manner. This means a consistent level of high quality. Or at least this is what you can expect from Leisure Pools, which is the leading manufacture in Fiberglass pool technology and why Seasonal World has decided to partner with this brand. 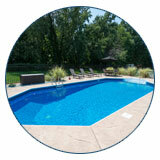 All Fiberglass pools are shipped as once piece and then installed on site. Seasonal World makes this process even easier by stocking over 100 Fiberglass pools in our Jackson, NJ warehousing facility – which means the pool spends less time on the roadway and you spend less money getting the pool to your home. Seasonal World’s exclusive partnership with the Leisure Pools brand makes ownership easy and affordable. Most fiberglass pool installation are completed and filled with water in just one day. Less build times, means you and your family are enjoying poolside fun faster. Check out our installation video below to see how Seasonal World’s install this type of pool. Every Leisure Fiberglass Pool installed by Seasonal World is supported by one of the strongest and most comprehensive warranties in the industry. Leisure Pools brand of Fiberglass pools are backed with a Limited Lifetime Structural Warranty and a Limited Lifetime Structural Osmosis Warranty. A member of the Seasonal World Team will be more than happy to share more warranty information with you or answer any questions that you may have. Everything has its up and downs, its good and bad, its positives and negatives… Well you get the idea. See the side by side breakdown of the biggest pros and cons of ownership of a Fiberglass pool. A Fiberglass pool from Seasonal World is local! Seasonal World stocks over100 Fiberglass pools in our Jackson, NJ warehousing facility – which means the pool spends less time on the roadway and you spend less money getting the pool to your home. Limited Lifetime Structural Warranty and Limited Lifetime Structural Osmosis Warranty. A Seasonal World Fiberglass pool comes standard in choice of 7 different colors. This may not be the case with every fiberglass pool builder you encounter. Lowest cost of long term ownership when compared to other pool construction types. Pool structure that cannot rust, oxidize and corrode. Pool structure performs well in areas that have high water tables or clay type soils. Compatible with salt water pools. Limited number of available sizes and shapes. Unable to customize interior pool features or depth. Higher price point than Vinyl Liner pools but a lower price point than Gunite pools. Widely installed by companies that are not pool builders. This means current or former masons or landscapers have entered the pool industry and often are the root cause for the unpleasant pool installations and unhappy Pool Buyers. Seasonal World always has been and always will be a pool builder first! We design, we build and we service your pool for the life of your pool. Is it common for future pool buyers to think that Fiberglass pools are the least expensive type when compared to the others. However this is not the case. Fiberglass pools are actually in the middle of the pricing spectrum. They are higher price point than Vinyl Liner pools but a lower price point than Gunite pools. With this type of construction the pricing will vary depending on the options and features that will ultimately make up your purchase. On average, a Seasonal World Fiberglass pool packages will start around $36,995 - $43,995 from small to medium sized pools. A larger Fiberglass pool package will typically range from $43,995 to $53,995. Again, the overall price of your project will vary due to the options and features that you may add into your final decision. To learn more about pool pricing tailored to your needs, contact Seasonal World today at 609.259.8330 to schedule your Free In Home Consultation with a Seasonal World Backyard Living Specialist. Or Click Here to Request an In Home Consultation Online. Watch the complete installation of a Fiberglass pool at a recent project completed by Seasonal World. This video installation shows a backyard from start to finish and the amazing transformation that takes place in a short period of time. See our team of professionals take pride in their work while they make the dream of pool ownership a reality for another family! Click here to see tons of actual Fiberglass Pool Projects that Seasonal World has completed. Picking your liner pattern is exciting! Click here to see all of the available patterns Seasonal World has to offer for 2018. After looking for about 3 to 4 months Seasonal World was definitely the easiest choice for us. Did You Know That Seasonal World Offers 4 Different Types Of Inground Pools? That’s right, Seasonal World is the only builder in NJ and PA that offers 4 different types of pool construction under one roof. This gives you the freedom to find a pool that perfectly fits your needs and budget. Don’t settle for a pool company that offers one type of pool. Know there are choices and find the one that is right for you. Affordable, dependable and long lasting – that is what makes a Steel Wall Vinyl Liner pool a popular option among families. Truly the strongest vinyl liner pool available today. With unique features found only at Seasonal World, learn why a Cement Wall Vinyl Liner pool is the one type of pool you don’t want to overlook. The sky is the limit with a custom gunite swimming pool from Seasonal World. Limitless design possibilities and truly unique features. That is what makes gunite so special. Compare all of the various types of pools offered by Seasonal World with our easy to understand comparison guide. Here you can quickly gain knowledge of how each pool stacks up against one another.